The Chateau Frontenac Hotel and Dufferin Terrace area (A, see map) is the best starting point for a tour of Quebec. The Chateau is the city's most prominent landmark and also a place you can return to conveniently for clean restroom facilities, coffee, etc. It more or less occupies the site of Fort St. Louis, the residence of the governor during the time of Shadows on the Rock. Cather stayed at this hotel several times in the late 1920s and early 30s while she was working on her novel. Notice the large full-length portrait of Frontenac in the hotel lobby. This is an idealized portrait by an Italian painter whose forgotten name (according to the hotel) is folded behind the frame, and it has hung in the lobby since the opening of the hotel in the 1890s. It is of some importance for us because Cather would have seen it. Dufferin Terrace in front of the hotel offers an excellent view of Quebec's Lower Town, and, to the far left, the Isle of Orleans. The ferry between Quebec and Levis docks immediately below, and the round trip across the river (well worth the $5) is most spectacular at dusk, when the lights of the city are on. Map of Quebec City The main altar of Notre Dame des Victoires Church. Although this altar was installed in 1878, Cather places it in the church in the 17th century and has Cecile imagine "that the Kingdom of Heaven looked exactly like this from the outside." From the terrace you can take the Funicular (B) (website) to the Lower Town. The Funicular descends into the Jolliet House, which dates from 1683. Continue straight on rue Sous-le-Fort and go left on rue Notre Dame to Notre Dame des Victoires Church (website) and the Place Royale (C). Inside the church you will see the fortress altar that Cecile and Jacques marvel at in Shadows and also the paintings of St. Genevieve in the side chapel. Cather's description of these mixes up their contents, intentionally or through memory lapse. In the Place, where Auclair does his marketing, you will see the bust of Louis XIV. This statue, erected in 1948, is not the one Cather describes as ugly. Continue right on rue Notre Dame to Cote de la Montagne (D), which Cather calls Mountain Hill. Turn left and continue up the hill. Halfway up the hill is where Cather locates the Auclair house and shop. Take a left at the top of Mountain Hill to the rue Buade. This street skirts the right side of the cathedral (E). Turn the corner and enter the cathedral, which is on the site of the 1650 building enlarged by Bishop Laval and then destroyed in 1759. The present structure dates from the late 18th century and its interior is decidedly baroque. A chapel off the right side aisle contains Laval's tomb and a memorial to him. 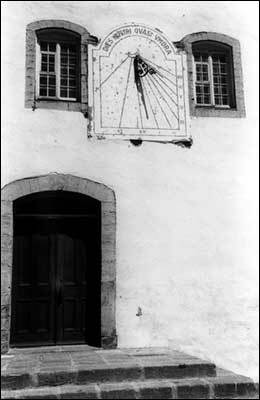 The sundial in the Quebec Seminary courtyard with its inscription Dies nostri quast umbra, "Our days as if a shadow" (Chronicles 29:15), the source of Cather's title Shadows on the Rock. Adjacent to the cathedral is Laval Seminary (F). Cross the courtyard. You will see a sundial over the entrance door with an inscription in Latin from (1Chronicles 29:15). The translation "Our days as if a shadow" seems to have inspired Cather's title. The old Laval dormitories house the Museum of French America (open daily from June to September), which is well worth a visit not only because it contains paintings, manuscripts, and artifacts reflecting French culture in America, but also because it gives access to the rooms and chapel of the old university. Upon leaving the museum, return to the cathedral and walk down rue Sainte Famille (G) Holy Family Hill in the novel, where the Pommiers have their cobbler shop. As you descend the hill be sure to notice on your right vintage houses dating back to the 17th century. Return to the cathedral and turn right to the Cote de la Fabrique (H), which boasts several elegant shops and eateries. Across the street you will see Quebec's City Hall (Hotel de Ville), on the plot of ground formerly occupied by the Jesuit College, along the allee of which Cecile would jump rope. Continue on this street to rue Saint Jean (I), and nearby you will find some good places to lunch. Casse-Crepe Breton, 1136 rue Saint Jean, and Chez Temporel, 25 rue Couillard, are recommended. Almost across rue Saint Jean from Cote de la Fabrique is rue Collins. This short street ends at the Hotel Dieu (J), administered by the Hospital Sisters, where Cecile and her father visit Mother Juschereau and Cecile is told the story of Catherine-de-Saint Augustin. The sisters run a museum here, although it is scheduled to be closed for renovation during 2003. The Catherine de Saint Augustin Center, however, may still be accessible, and here you can view Catherine's relics. If you backtrack to City Hall, you can take rue des Jardins to rue Donnacona and you will be at the chapel, convent, and school of the Ursulines (K). This is the oldest continually operating school for women on the continent and much of the building dates back to the 17th century. Jeanne LeBer studied here, as did Cather's Cecile prior to the opening of Shadows. The present chapel (closed Mondays), although built in 1902, is worth a visit, and the Ursulines operate an interesting museum (closed Mondays) on the premises, where you can view material on Marie de l'Incarnation and some fine embroideries made by the Ursuline Sisters. Going right on the rue Donnacona (as you exit the museum) you will come out on rue St. Louis and see the Chateau Frontenac on your left. A half block to your left on rue St. Louis is Jacquet House (#34), built in 1690. Here a fine Quebec cuisine restaurant operates under the name Maison des Anciens Canadiens. I would recommend this restaurant for dinner as well as the less expensive Les Freres de la Cote (1190 rue Saint Jean) and also La Petit Coin Latin (off rue Saint Jean at 8 ½ St. Ursule). Recommended restaurants outside the walls include Le Mesclun, 93 Sault-au-Matelot, and the much less expensive Buffet de l'antiquarie, 95 rue Saint Paul. Both of these are in the area marked L.
Be sure your visit to Quebec includes a walk around the Citadel (M), accessible from Dufferin Terrace as well as from rue Saint Louis. Enhanced by the British from the old French fortification, the Citadel offers wonderful views. Tours are available here and there is a museum, although I think the views and the walks along the top of the walls are what's most interesting. You will see the Plains of Abraham (N), the site of the battle in 1759 in which the French lost Canada to the British. There are many beautiful walks through this park, which is a way for you to approach the Museum of Quebec (O), containing a wonderful collection of colonial woodcarving and Quebec painting from colonial times through Impressionism. The museum (open daily in summer) will give you the flavor of Quebec culture that Cather was exposed to on her visit. You can return to the walled city via the Grande Alle (P), a continuation of rue St. Louis outside the walls. If you have time to explore the environs of Quebec, be sure to visit the Isle of Orleans. You can see it and also the bridge that provides access to the island from Dufferin Terrace. This is the fertile island of Cecile and Pierre's visit the Harnois family. The views here are magnificent and I would recommend the 40 mile drive around the island. There are six villages, each with an historic church. 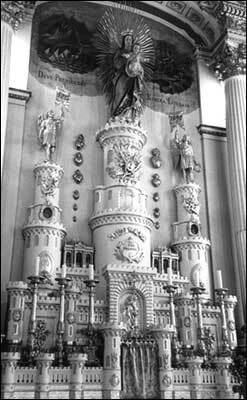 My favorite is Sainte Famille, in the parish founded by Bishop Lavel in 1661. From here you can see across the river to your right the shrine of St. Anne de Beaupre. Recommended dining places on the island include Moulin de Saint Laurent and La Canard Huppe, both in the parish of Saint Laurent. As you leave the island and cross the bridge, be on the lookout on your right for a view of Montmorency Falls, which (like St. Anne de Beaupre) is well worth a visit. Map of Quebec. The Jeanne LeBer sites can be reached by returning to the front of Notre Dame and continuing on rue Notre Dame to rue St. Jean Baptiste, and turning to the right (toward the river). Midway down this street (on your right) stood the convent of the Congregation Sisters (B), to which was attached a chapel in which Jeanne had her cell built. 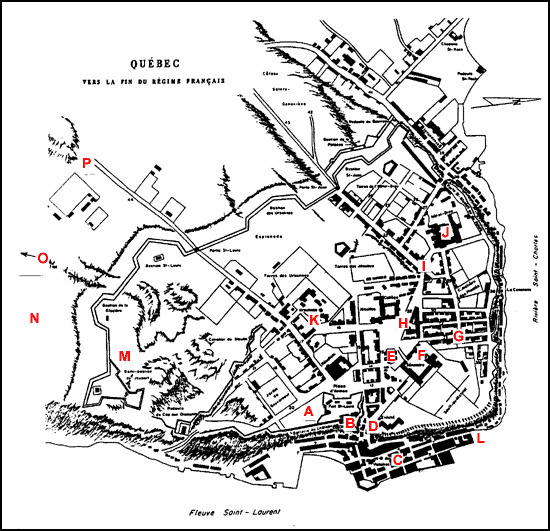 If you continue on rue St. Jean to rue St. Paul and turn right you will be on the block where the LeBer house stood and where the Hospital Sisters of Montreal's Hotel Dieu had their chapel, the one containing the sanctuary lamp inspiring Jeanne's vow to live a reclusive life next to the Sacrament. Rue St. Paul is one of the city's oldest streets and presently offers a variety of shops, galleries, and restaurants. Continue on St. Paul to Place Royale, adjacent to the Montreal Archaeology and History Museum (C) (closed Mondays) offering multi-media presentations of the history of the city. Additional historical background is available at the interpretation center of the nearby Montreal History Center (D), also closed Mondays. Returning to rue St. Paul, retrace your steps, passing rue St. Jean Baptiste and continuing to Place Jacques Cartier (E), a public square with outdoor cafes, flower shops, street entertainment, etc. Cartier docked his ship along the river at the south end of the square, and at its north end is Montreal's City Hall (F), where in 1967 Charles de Gaulle gave his famous (or infamous) "Vive la Quebec libre" speech. Across from City Hall is Chateau Ramezay (G), built in 1705 as a residence for the eleventh French Governor of Montreal. Return to rue St. Paul, turning left to the Bonsecours Market (H), a long and columned 19th century structure with a dome, and continue to the Chapel of Our Lady of Perpetual Help, or Notre Dame de Bon Secours (I), housing the Marguerite Bourgeoys Museum (chapel open daily, museum closed Mondays). Bourgeoys was the founder of the Sisters of the Congregation and an influence on Jeanne LeBer. The present stone chapel replaces the wooden structure commissioned in 1657 by Bourgeoys. It contains a 16th century statue of the Virgin and Child she brought from France. Literature on Bourgeoys and LeBer is available here. Montreal is a metropolis, so I feel inadequate to offer guidance to its wealth. Strolling the maze of streets in old Montreal and Quebec will give you the flavor of the period recreated in Shadows on the Rock. Ambience is the essence; it's what Cather had a genius for capturing and communicating in fiction.